Payers are organizations or individuals that pay for the healthcare supplied to the patient. These organizations or individuals can be: facilities or people who financially guarantee or who are responsible for the patient (such as parents or guardians of minors), organizations with direct financial responsibility, combinations of these or the patient themselves. Recording the information of the paying authorities and people serves to simplify payment of the fees for the supplied care and to provide insight in advance on how these fees are to be paid, especially when it comes to non-insured healthcare. Those that developed the model took into account the information exchanged in the ‘Check for Right to Insurance (COV)’. To do so, the COV VZ801/802 message definitions were used, v4 (02-nov-2012). The structure of the 'European Health Insurance Card (EHIC)' information was taken into account as well. NL-CM:1.1.1 Payer Root concept of the Payer information model. 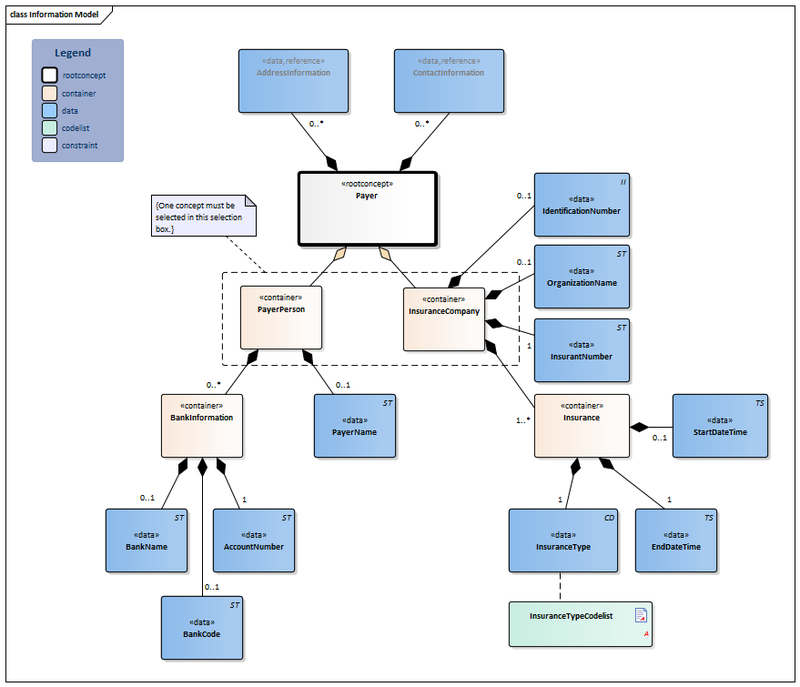 This root concept contains all data elements of the Payer information model. NL-CM:1.1.2 PayerPerson (0..1) Container of the PayerPerson concept. This container contains all data elements of the PayerPerson concept. NL-CM:1.1.5 PayerName 0..1 Full name of the paying person or organization (legal entity). NL-CM:1.1.4 BankInformation 0..* Container of the BankInformation concept. This container contains all data elements of the BankInformation concept. NL-CM:1.1.9 BankName 0..1 Name of the financial organization. NL-CM:1.1.10 BankCode 0..1 Code indicating the bank and branch. For European countries, this is the organization’s BIC or SWIFT code. NL-CM:1.1.11 AccountNumber 1 The payer’s bank account number at the listed organization. For European countries, this is the IBAN. NL-CM:1.1.3 InsuranceCompany (0..1) Container of the InsuranceCompany concept. This container contains all data elements of the InsuranceCompany concept. NL-CM:1.1.8 Insurance 1..* Container of the Insurance concept. This container contains all data elements of the Insurance concept. NL-CM:1.1.13 StartDateTime 0..1 Date from which the insurance policy coverage applies. NL-CM:1.1.14 EndDateTime 1 Date until which the insurance policy coverage applies. This item maps the ‘Expiry date’ on EHIC field 9. NL-CM:1.1.7 IdentificationNumber 0..1 Unique healthcare insurance company identification (the UZOVI number). NL-CM:1.1.16 OrganizationName 0..1 Full, official name of the healthcare insurance company. If the UZOVI number is entered as an identification number, this will be the name as listed in the UZOVI register and the name which is returned in the Check for Right to Insurance (COV). NL-CM:1.1.17 AddressInformation 0..* The payer’s address information. NL-CM:1.1.12 ContactInformation 0..* The payer’s telephone number and/or e-mail address.